My name is Tony Elumelu, and I am proudly African, by way of Nigerian descent. I am 100% made in Africa – born in Africa, schooled in Africa, live in Africa, and as my young African brothers and sisters would say, I “hustled” in Africa, and eventually made a mark in our world today all from our home continent of Africa. Being African did not stop me from achieving my dreams. In fact, being African propelled and filled me with the passion and sense of purpose that has been responsible for all my successes and my best decisions so far. I love that I am African. I am proud to be African. I say all this because it is important that we properly frame and contextualise our conversation today, which by the way will be very interactive. It is critical that we raise our children and young ones with a champion mentality and not a victim mind-set. You should all be proudly Haitian. You should own your heritage and embrace your nation and not allow your collective narrative to be defined and restricted to natural disaster, strife and calls for charity. Haiti is much bigger than handouts or aid. Of course, it is unfair that this is the most dominant perception of your country in the international media, but as I pointed out in Chatham House last year, this is also the case for Africa where there is a pervasive negative stereotype about our continent and people. But as an African, I refuse to allow this become my reality. This is what you must do as well. You must break away from that small box that the world may have put Haiti in and see yourselves through a fairer, more holistic lens. The story of Haiti is one of resilience, one of an undying hope and a people with the rare ability to survive and re-emerge from the direst situations. This is what we should celebrate about Haiti. We should celebrate your sense of enterprise and resilience: Even in the face of frequent natural disasters, two-fifths of your nation still go to work each morning, tending to their farms and working to ensure food security for your country. It is true that less than three years ago, Hurricane Matthew caused incomprehensible damage to your economy, wiping out vast amounts of the toils of your labour, leaving hundreds of schools destroyed and countless communities devastated, but since then your country has shown that these crises have not been in vain as you are now better prepared and stand more formidably in the face of subsequent natural disasters. Indeed, you have shown that you have learned from your past and refuse to let it define your future. This is the same can-do spirit that wide scale transformative entrepreneurship demands. The entrepreneurship spirit is one of fierce, unrelenting determination that refuses to give up. And ladies and gentlemen, I don’t think that there is a more natural home for this conquering spirit of entrepreneurship than in the Republic of Haiti. It is only befitting that today, in honour of this spirit of entrepreneurship, we are inaugurating Alpha Haiti, the first public technological incubator, in the line of many more to come. I am indeed honoured to be here today following the kind invitation of your President. The Chairman of Heirs Holdings, a family owned investment company with a portfolio spanning the power, oil and gas, financial services, hospitality, real estate and healthcare sectors, operating in twenty-three countries worldwide. The Chairman of the United Bank for Africa, a leading Financial services powerhouse in 20 African countries, United Kingdom, France, and the only Africa bank with a deposit-taking capability in the United States of America. But more importantly, I stand here today as a catalytic philanthropist and the Founder of The Tony Elumelu Foundation, the leading philanthropy in the world championing African entrepreneurship and entrepreneurs. Mr President’s invitation was to speak on ‘How entrepreneurship significantly leads to economic growth in Africa, and what Haiti can learn from it’. It is a timely topic because the reality is that no advanced nation has achieved that status without prioritising and driving entrepreneurship and small business growth. Entrepreneurs and SMEs are without doubt, the engine of economic growth. Just as a car can neither move nor accelerate without a working engine, an economy cannot grow and achieve meaningful development without a foundation of thriving entrepreneurs and small businesses. Just as an automobile needs fuel to function, an economy cannot advance without being fuelled by entrepreneurs and small enterprises whose innovation propels nations to prosperity. In the United States, the world ‘s biggest economy, 75% of its 16 million businesses are run as sole proprietorship, in other words, run by self-employed entrepreneurs. The U.S. continues to recognise and support small businesses as critical elements to economic recovery and strength, the building of an advanced future and sustained competitiveness in the global marketplace. China’s explosive economic growth over the past 25 years is due largely to eliminating bureaucratic bottlenecks and limits that restrain and cage the entrepreneurial drive of the Chinese people. In the OECD area, SMEs are the predominant form of enterprise, accounting for approximately 99% of all firms, responsible for about 70% of jobs, and are major contributors to value creation, generating between 50% and 60% of value added creation. SMEs contribute to more than half of employment and GDP in most countries irrespective of income levels, and in emerging economies, create up to 45% of total employment and 33% of GDP. Historically, entrepreneurs have always played a central role in the development of nation states. Aside from rentier states, which depend extensively on the availability of mineral resource rents, most economically prosperous nations in the world have strong, innovative and competitive business enterprises and entrepreneurs as the bedrock of their economic development and prosperity. The value of contribution of entrepreneurship to employment generation is invaluable, giving SMEs today an increasingly important role on the global stage. In the first decade of the 21st century, Africa’s image changed dramatically, albeit temporarily, from that of the ‘hopeless continent’ to the continent of ‘lion economies’, analogous to the ‘Asian tigers’. This shift was rooted in strong numbers and positive data that marked a departure from hitherto economic inertia: Five of the twelve fastest growing economies in the world were African, foreign direct investment had skyrocketed to five times its levels only one decade ago, and there was an emerging African middle class with newly minted disposable income and an appetite for foreign consumer goods. Africa was cited as a premier destination for new opportunities for and for investors keen to make unprecedented returns. The force of this narrative may have considerably waned abroad in recent years, but for Africans in Africa, we refuse to give up on ourselves and in our continent. Our tremendous demographic dividend – or youth bulge – means that we have millions and millions of young men and woman whose futures we can make or break. We call this Africapitalism and demonstrate this through the TEF Entrepreneurship programme which is well on its way to supporting 10,000 African start-ups. At TEF, we have chosen to capacitise, empower and create economic hope for our young Africans by directly investing U.S $100m in the next generation of African entrepreneurs with the potential to transform the continent and enable us to collectively achieve our development aspirations. These are our future African leaders and Africapitalists. 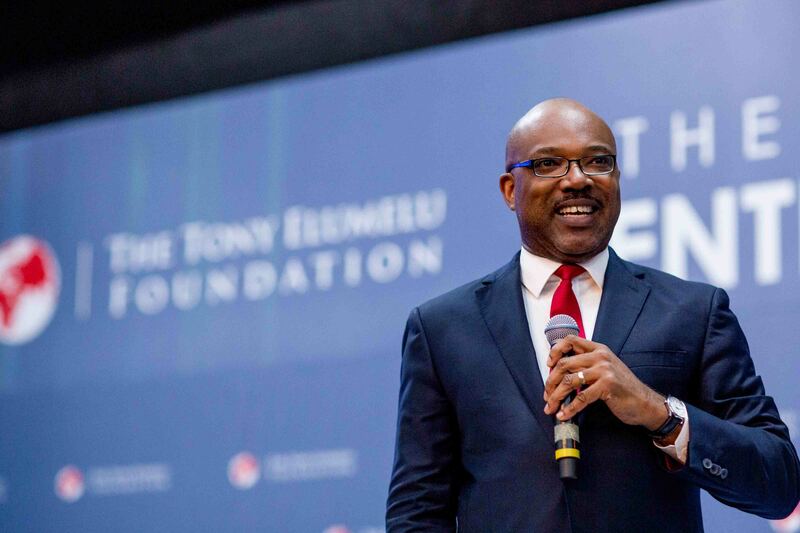 The Tony Elumelu Foundation has taken a direct approach to fostering entrepreneurial development, providing much-needed funds to these small commercial enterprises, and supporting to actualise the aspirations of these SMEs because we understand and appreciate that SMEs are the engine of an economy. A systemic barrier preventing our African SMEs from growing has been the absence of a conducive business environment in some parts of our continent, with legal, financial and environmental bottlenecks. To address this, at the Tony Elumelu Foundation, we have built a holistic programme that addresses all parts of the entrepreneurial chain. We identify the entrepreneurs, train them in business management modules for 12 weeks with the support of mentors in their respective industries for guidance, and expose them to networking and partnership opportunities with governments, corporates and other small businesses. This training is essential as we believe that business education is as important as capital, a fact that has been confirmed enthusiastically by our entrepreneurs who have deployed the training to run successful start-up enterprises. In addition to all of the above, because we understand that entrepreneurs do not operate in silos, and that they are vulnerable to policy changes and laws, TEF also engages in targeted advocacy leveraging our networks in the African public sector, to create an enabling environment for small business growth. At the Tony Elumelu Foundation, we are proud to employ a new philanthropic framework, one that combines traditional charity and business acumen to derive self-sufficiency for entire communities, for generations. Entrepreneurship is a bottom up approach to economic diversification and one way of addressing the issue of poverty. The lethal combination of a lack of hope and opportunity, and economic unemployment is perpetuating a serious vicious cycle of poverty that must be broken. So far, the journey has not been without challenges, but the results, very impactful. The Tony Elumelu Entrepreneurship programme has impacted over 4,000 people who have benefited from our programme which is globally recognised as the largest commitment to African entrepreneurs, due to our scale, size of capital commitment and training opportunities offered. In the 1st year 2015, we had 20,000 applications and female representation was 24%, 2nd year 45,000 applications and the female representation went up to 36%, in 2017 we had 98,000 applications across Africa and female representation was about 39.17% and in 2018 we had 151,692 applications and female representation increased by 2% to 41.2%. To raise female participation, we employed a variety of strategies including targeted communications, women focus groups, appointing female role models for online and offline campaigns, etc. We are firm in our focus on improving gender representation and diversity because we acknowledge that when you empower a woman, you empower whole communities for life. The Foundation’s efforts are complemented by a burgeoning and vibrant entrepreneurial ecosystem in Africa with accelerators, incubators and hubs playing very key roles. South Africa has 59 active hubs, followed by Nigeria (55), Egypt (33), Kenya (30), and Morocco (25). Together, these five destinations account for over 45 percent of Africa’s tech hubs. Other fast growth ecosystems include the Democratic Republic of the Congo (DRC), Zambia, CDI and Togo recording high growth and productive activity in their ecosystems between 2016 and 2018. The last couple of years have also been characterised by the rise of tech giants’ interest in the untapped opportunities of African markets. CEOs including Mark Zuckerberg (Facebook), Sundar Pichai (Google), and Jack Ma (Alibaba) visited major hubs from Lagos to Nairobi, corporate partnerships mushroomed and players including Amazon and Alibaba increased their presence across the continent. While entrepreneurship is growing rapidly in Africa, every day, we do not forget that entrepreneurs continue to face significant domestic challenges that impede their efforts, including a lack of access to funding, support services, skills training, and we do our best to correct these. I commend the Presidency again for this worthy initiative to encourage entrepreneurship at all levels. It is no secret that in Haiti, formal sector jobs are scarce, especially in rural areas, so in order to get by ordinary Haitians have had to create their own sources of income. For many this means farming. For others, it means driving a motorcycle taxi. For others still, it means making and selling charcoal in an open-air market. Whatever the case, it’s clear that in order for Haiti to continue to progress and move forward as a nation, the entrepreneurial spirit in all of you must be reinvigorated and sustained. I implore you to embrace the drive and ambition to pursue big dreams even in conditions of great uncertainty. You must have the willingness to take bold steps, and make personal commitments in pursuing business ventures with potential even when the path appears difficult. It is about having a mindset devoted to innovation, flexibility, nimbleness and the ability to think differently. This is what I call the growth mind-set. Everyone dreams. It is the easiest thing to do, but what is important is not the ability to dream but how you translate that dream into action and reality. As an Entrepreneur, you first start with the dream and vision, then you come up with strategies for executing that vision, and you assemble the people who will help you execute the strategies. But you must first believe that you have what it takes to succeed and you would succeed. That energy and discipline that you apply to translate a dream, an idea, a vision to reality is the defining force. Nobody will reward you for having great ideas, but you will be rewarded for outcomes and what you have achieved. Congratulations again to the great people of Haiti and I wish you the very best. May your best years be ahead of you. Posted in Interview & Speeches.